HARARE, Zimbabwe (AP) Pakistan had five balls to spare when it beat Zimbabwe by seven wickets on Wednesday and eliminated the African host from the Twenty20 tri-series tournament. Solomon Mire missed out on the chance to become Zimbabwe’s first century-maker in a T20 international as his 94-run knock carried Zimbabwe to 162-4 after captain Hamilton Masakadza lost his first toss in the tri-series and his team was put in to bat. Opener Fakhar Zaman (47) and Hussain Talat (44) led Pakistan to 163-3 in 19.1 overs against an inexperienced bowling attack as Pakistan registered its second win against Zimbabwe. 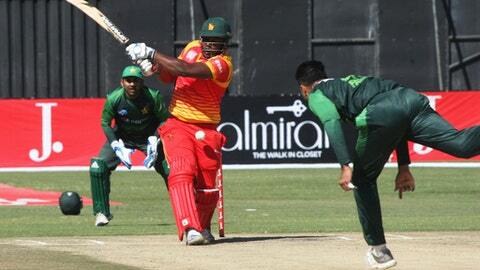 It was Zimbabwe’s third straight loss. Australia plays against Pakistan on Thursday before both teams meet in Sunday’s final. Mire stood tall against Pakistan’s full-strength attack as left-arm fast bowler Mohammad Amir (1-25) got his first game of the series and replaced Usman Khan. Mire and Cephas Zhuwao (24) provided a solid opening partnership of 49 runs before Tarisai Musakanda (33) added 64 runs for the third wicket with Mire. Mire, who hit six sixes and six fours, reached his half-century off 32 balls when he hoisted left-arm spinner Mohammad Nawaz for a six over long off in the 11th over. Pakistan struggled for wickets despite seamer Faheem Ashraf (1-24) and leg-spinner Shadab Khan (1-28) bowling a decent four overs each in the middle overs. Mire looked set to become the first Zimbabwe batsman to score a century in a Twenty20 before he holed out at deep mid-wicket off seamer Talat in the 18th over – only a ball after Asif Ali missed a sitter at deep square leg. Mire also featured in two dismissals during Pakistan’s innings as he took a fine catch in the deep to dismiss Haris Sohail. He then denied Zaman a half century through his medium pace when the left-hander was caught at mid-on. Captain Sarfraz Ahmed (38 not out) and experienced Shoaib Malik (12 not out) kept their composure and carried Pakistan home.